Denise P. was a social worker at a community mental health center serving a large urban area. The agency's executive director informed Denise that the agency received a large federal grant to implement a peer-support program for clients who struggle with major mental illness and addictions. According to the program model, individuals who have been diagnosed with and treated for major mental illness and addiction, and who have been stable for a minimum of three years, would be recruited and trained to be peer support professionals. Their duties would include providing support to active clients in the form of visits, telephone conversations, social activities, and the like. The peer support program is based on an empowerment model that acknowledges the strengths of people who cope skillfully with major mental illness and who can serve as valuable resources to clients. Denise supports the initiative and the ways in which the peer support model is consistent with traditional social work values. At the same time, Denise understands that this new program poses significant ethical challenges. She assembled a team of senior staffers and brought in an outside ethics consultant to identify the ethical challenges and develop reasonable protocols to address them. Many mental health professionals trace the origins of peer support services back to the 1970s, soon after the dramatic emergence of the community mental health movement. In fact, the concept emerged much earlier, in the 18th century. In 1793, Jean Baptiste Pussin, the superintendent of the mental ward at Bicêtre Hospital in Paris, wrote to Philippe Pinel, the hospital's chief physician, saying, "As much as possible, all servants are chosen from the category of mental patients. They are at any rate better suited to this demanding work because they are usually more gentle, honest, and humane." Pussin favored hiring former patients because, he believed, they would be kind and would avoid treating patients with the cruel methods to which they themselves had been subjected. Peer support programs pose several key ethical challenges. 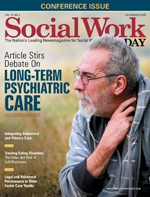 Although peer support specialists typically receive extensive agency-based training about their unique roles, most haven't received formal social work education or comprehensive ethics education. These specialists often provide various forms of social service that require skilled judgments related to client privacy and confidentiality, boundaries and dual relationships, informed consent, paternalism, competence and expertise, documentation, and client abandonment. Social workers who oversee such programs have a duty to ensure that peer support specialists are familiar with these ethical challenges. • Privacy and confidentiality: Peer support specialists typically have access to sensitive information about clients' lives, which may include details about mental illness, substance abuse, criminal activity, HIV status, and sexual orientation, among others. Although peer support specialists may not have the same legal duties as social workers with regard to the careful management of clients' private and confidential information, social workers who oversee these programs should ensure that peer support specialists understand prevailing standards with regard to clients' right to privacy and confidentiality and the exceptions to these rights (for example, when disclosure of confidential information may prevent imminent, serious, and foreseeable harm to the clients themselves or third parties). • Boundaries and dual relationships: Peer support programs pose unique boundary and dual-relationship challenges. Peer support specialists who are hired by agencies that once served them may become colleagues of their former service providers. They may participate in staff meetings together and attend work-related social events. These interactions may have therapeutic benefit to these former clients, yet they may also complicate boundaries because of the shift from the status of client to the status of former client and colleague. Particular challenges arise if former clients who become peer support specialists require mental health or addiction services again from this very same agency. Transitioning from client to former client to employee and back to client can be especially difficult. In addition, former clients hired as peer support specialists may serve current clients who were clients at the same time the peer support specialist was a client. Thus, a current client may know a great deal about the peer support specialist's personal history and struggles, which could complicate their working relationship. Another complication pertains to self-disclosure. The peer support model is based on an assumption that informal relationships between specialists and clients can be therapeutically helpful to clients. These informal relationships may include social activities and conversations that resemble chats between friends. These ambiguous boundaries may be difficult to navigate, particularly when peer support specialists are expected to share certain otherwise private or confidential information about clients with agency staffers. • Informed consent: Clients who receive mental health and addiction services have a right to know what kinds of services their agencies offer and staffers' roles and credentials. This is true whether service providers are psychiatrists, social workers, or peer support professionals. Agencies that offer peer support services should provide clients with clear descriptions of the role of peer support professionals, including information about professional boundaries and confidentiality. • Competence and expertise: Programs that provide mental health and addiction services typically employ a mix of professionals and paraprofessionals. Some staffers have received formal professional education (e.g., in social work, psychiatry, psychology, psychiatric nursing, and counseling) and some—especially those in entry-level positions—have not. Agencies typically provide considerable in-service training to enable these staffers to perform their duties. Peer support professionals are among those staffers who should receive extensive training to enhance their proficiency and, especially, their understanding of key ethical issues and standards. • Continuity of service: One of the risks associated with peer support programs is that peer support professionals may relapse and have difficulty performing their professional duties. Although challenging, often such circumstances are manageable. Even employees who don't have a history of mental illness or addiction and aren't former clients take time off because of illness or disability. This is a fact of life. Employers typically anticipate having to provide coverage for employees who miss work because of health-related challenges. In this respect, peer support professionals should not be treated any differently. If the severity of their struggles interferes with their ability to sustain employment, they should be treated the way any employee with comparable challenges would be treated. Options such as a medical leave, job coaching, and supplemental supervision should be available as needed, as they would be for any employee. For more than two centuries professionals have understood the value of peer support. Contemporary social workers have a rich understanding of the importance of peer support and its essential role in the delivery services. And today's practitioners have a particularly impressive appreciation of the complex ethical dimensions posed by peer support.